NEWMAN, Calif. (KFSN) -- Gustavo Perez Arriaga, the man accused of shooting and killing Newman Police Corporal Ronil "Ron" Singh has been captured. The Stanislaus County Sheriff's Office says that Arriaga was taken into custody, using Cpl. Singh's handcuffs, nearly 200 miles away in the Kern County town of Lamont early Friday morning. The suspect's brother, 25-year-old Adrian Virgen, and a co-worker, 32-year-old Erik Razo Quiroz, were also arrested on "accessory after the fact" charges for attempting to protect Arriaga. Authorities say both men are also in the country illegally. Kern County Sheriff's Donny Youngblood said that three additional people were also arrested in the South Valley for aiding and abetting Arriaga. Stanislaus County Sheriff Adam Christianson says that Arriaga was attempting to make his way to Mexico when he was arrested. He was found at a house in Lamont, California that was being monitored by law enforcement. 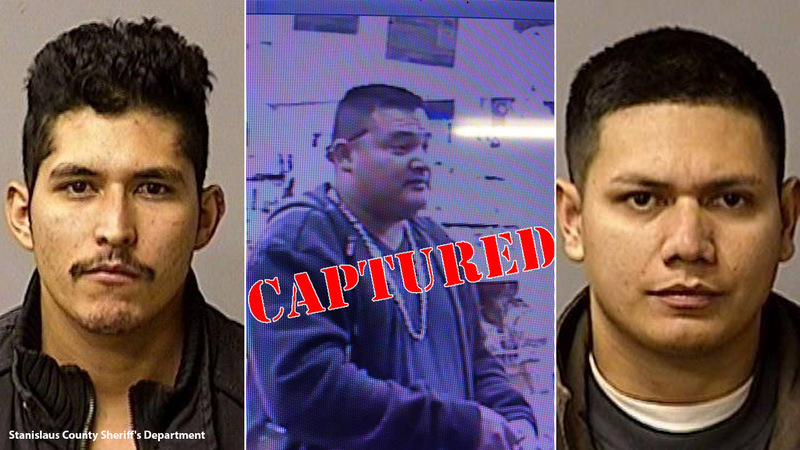 This is a triple-split photo of Erik Razo Quiroz, Gustavo Perez Arriaga and Adrian Virgen, who were arrested in connection with the fatal shooting of a Newman police officer. A vigil was held in the city of Newman for Corporal Singh. People from the city and even from outside paid tribute to the fallen officer, accompanied by lights, flowers and blue ribbons. Singh's wife and his K-9 partner Sam attended the vigil.